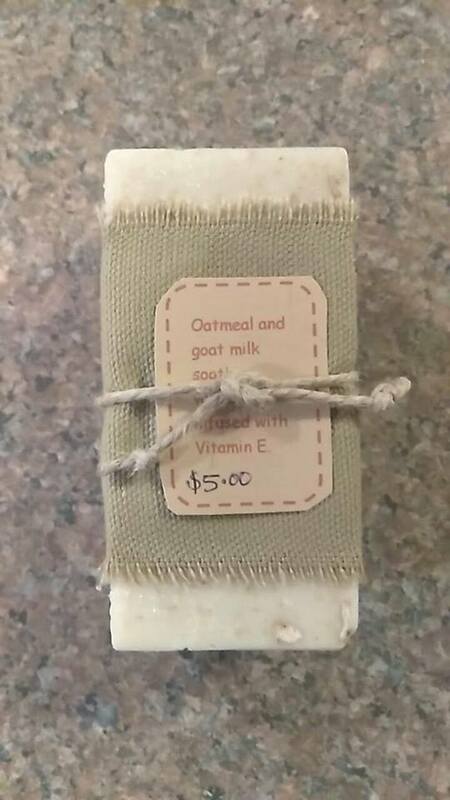 Goatmilk soap with oatmeal and honey that will help protect your skin, nourish it, and even aid skin healing and slow signs of skin aging. It’s soft and silky on your skin. 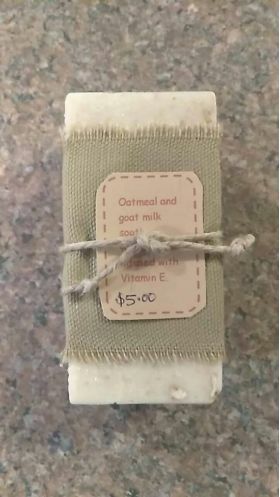 Honeyed Oatmeal Goatmilk Soap: Please note: this option does not include shipping, so it's for pickup only. You may also use this option if you've already added one Women of Grace Naturals product to your cart that includes shipping. If you would like additional soaps (but only pay shipping once), add one "includes shipping" product to the cart, then add as many "no shipping" products as you like. All options are on the left of your screen under "We also recommend..." Most soaps contain harsh chemicals that are harmful to our skin and actually exacerbate skin problems*! Our high-quality natural ingredients protect your skin, nourish it, and even aid skin healing and slow signs of skin aging. It’s soft and silky on your skin. It contains lovely ingredients such as goat’s milk, oatmeal, cocoa butter, honey, apricot oil, vitamin E, vanilla, and cedarwood oil. Read the list below to discover some of the research that has been don on these ingredients! Our soap has no artificial fragrance and a sweet mild scent. It’s low-sudsing and high-moisturizing…and very, very gentle on your skin. Available in 4+ oz bars. *For example many soaps contain sodium lauryl and sodium laureth. Both are dangerous. Research shows they are absorbed into our skin and stored in the liver and other tissues. It cannot effectively be removed from the liver, promoting toxicity throughout our lives! Ugh! Goat’s Milk Soap Base: Goat's milk soap delays signs of skin again due to its high content of alpha-hydroxy acids such as lactic acid. Goat's milk reduces skin inflammation due to its fat molecule content. The cream present in goat's milk is a moisturizer, soothing dry and damaged skin, possessing an anti-inflammatory effect. Goat's milk is packed full of essential nutrients and vitamins like vitamin D, C, B1, B6, B12, and E, that feed the skin and are absorbed into the body. Studies now show that goat's milk is effective for treating acne and skin conditions. This is primarily because goat's milk has anti-bacterial properties that delay the growth of microbial organisms that spur the spread of acne. Oatmeal: Its use as a skin protectant is regulated by the U.S. Food and Drug Administration (FDA) for medicinal purposes! That’s how effective it is! Oats acts as a mild cleanser because of the saponin (soaping) content. It has “strong ultraviolet absorbers” and the starches and beta-glucans are able to hold water, which aids its moisturizing impact. Oats help in the recovery of skin rashes and irritations by moisturizing, restoring the skin barrier, reducing itching, and regulating inflammation. Due to antioxidant benefits, oats can help in reversing damage caused by UV rays, pollution, harsh chemicals, etc. on your skin. It has ultra-violet absorption properties to protect against sun damage and photoaging, making it a gentle and effective after-sun wash. In studies it exhibits anticarcinogenic activity, fighting cancerous tumor formation and metastasis! That’s pretty amazing stuff! Honey: Honey is naturally antibacterial and antimicrobial, so it's great for acne treatment and prevention. Full of antioxidants, it is great for slowing down aging. It is extremely moisturizing and soothing Honey is clarifying because it opens up pores making them easy to unclog. It’s also a natural humectant (a substance that retains water), so it will maintain the skin’s natural moisture levels, keeping it soft, smooth, and wrinkle-free. Apricot Oil: Apricot oil: Full of Vitamins A, D, and E! As such, it contains anti-aging properties as well! Very nice for conditioning your skin. Cedarwood: Cedarwood definitely makes the list of essential oils used in dermatology due to its many beneficial effects on the skin, including its antiseptic ability. As a natural antiseptic, cedarwood oil can prevent the development and growth of harmful microorganisms that can negatively affect skin health. It has anti-inflammatory, antifungal, astringent, sedative and insecticidal properties! Nice! Vanilla: The exciting benefits of vanilla in our skin care products go far beyond the signature scent—though of course, that’s one of its great gifts! But we like it for other reasons, too. Vanilla is a great source of natural antioxidants, helping to protect against environmental stressors. It contains lovely B vitamins! You’ll find many of them in vanilla, including niacin, which is a key skin nutrient. Thiamin, riboflavin, vitamin B6, and pantothenic acid are also found in this natural extract. Vitamin E: Antioxidant and anti-inflammatory properties make it really good for your skin!